The program adds an additional 45 minutes to the child's school day. 1st STEP Bridge offers flexibility, depending on the child's readiness for a longer day. Parents can choose from one-, two-, and three-day options. The program also allows for a smooth transition into the preschool program. 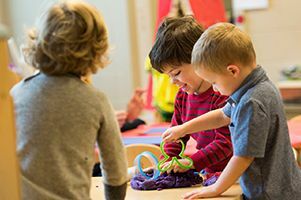 For those that have siblings in preschool or junior kindergarten, 1st STEP Bridge allows for all three programs to conclude at around the same time each day.